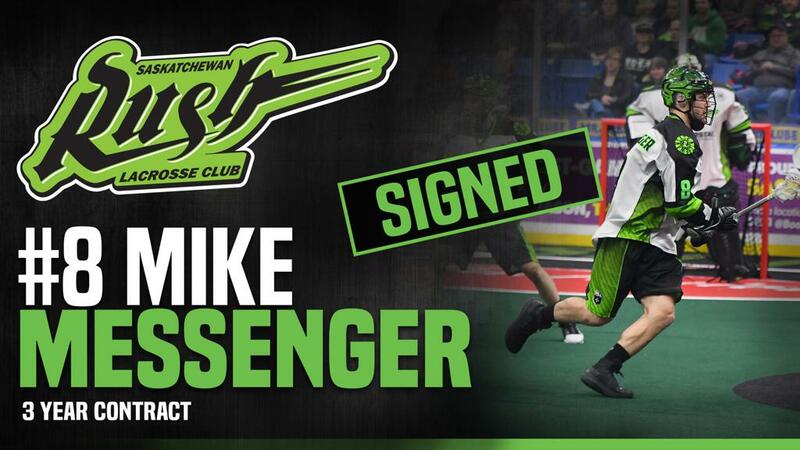 Saskatoon, SK - Just one day before the start of the 2019 Saskatchewan Rush season, the Rush have bolstered their defensive unit as General Manager/Head Coach Derek Keenan announced the re-signing of defenceman Mike Messenger to a three-year deal. Messenger is expected to be in the lineup when the reigning NLL Cup champions begin their new season Friday night as they visit the New England Black Wolves in Connecticut. Messenger was the third overall pick in the 2016 NLL Entry Draft, coming to the Rush just two picks after Saskatchewan selected Ryan Keenan in the number-one slot. The hulking defenceman, who stands 6-foot-2, 220 pounds, became an instant force on the Rush’s back end and wound up earning a spot on the NLL’s All-Rooke Team. He finished his first pro season leading all Saskatchewan defenders and placing fourth in the league amongst defenders with 15 points (7 goals, 8 assists). He was also fourth on the team with 86 loose balls along with being tied for third with 21 caused turnovers. As well, the Surrey, B.C., native’s rugged play earned him a team-high 40 penalty minutes. Last season, Messenger set a new career-high and led the Rush defenders with eight goals to go along with four assists for 12 points. The Limestone College product was second on the team with 22 caused turnovers and fourth with 92 loose balls. Over his first two pro seasons, Messenger has contributed three goals and four assists in eight playoff games.